What would it take to give patients the spiritual succor they want and hospital staff the skills to deliver it? Photo by Steven H. Gardner, M.D. 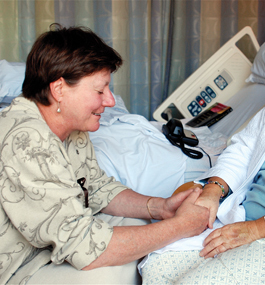 A hospital chaplain prays with a patient at the bedside. With its profound dependence on technology, modern medicine often seems nothing short of miraculous. But even the best medicine sometimes falls short of offering a successful treatment or a cure. That’s when many turn to God for help. According to recent national surveys, three-quarters of Americans believe God can cure people who have been given no chance of survival by medical science. And more than half of Americans regularly pray for their own health or the health of their family members. But while the media and, increasingly, the blogosphere argue about whether religion can improve health, the relevant query is being lost in the din. A more useful question is whether and how health care organizations support patients, families and staff who rely on spirituality or religion to cope with sickness or care for people who are ill.
To research my book “Paging God: Religion in the Halls of Medicine” (University of Chicago Press), which will be published later this year, I interviewed 150 health care providers at 17 academic hospitals across the country and spent a year shadowing them. I wanted to learn how today’s technologically sophisticated health care organizations address prayer and other forms of religion and spirituality. How do physicians, nurses and chaplains see religion in their work, and how do they respond to patients’ spiritual needs? Reflecting the nation’s growing religious diversity, hospitals in recent years have started eliminating traditional vestiges of religion — trading in explicit symbols like crosses in their chapels for images of nature and bubbling fountains. Many chapels are now called prayer or meditation rooms, and chaplaincy or pastoral care departspirituality or spiritual care services. These changes aim to accommodate people from as many religious backgrounds as possible. Likewise, interfaith chaplains now talk less about religious traditions or rituals and more about how people find meaning in their lives through relationships, pets or nature. One chaplain in training told me his hospital’s interfaith prayer service has become “so watered down you could find it in a phone book.” But the unintended consequence of this trend is that many families and patients don’t understand what chaplains offer and, worse, suspect proselytizing — long forbidden by the profession’s code of ethics. Paradoxically, traditional religious approaches remain strong among medical staff — I saw it especially among the nurses in two intensive-care units where I spent time. Nurses generally try to make space for patients’ religious and spiritual beliefs until they conflict with medical recommendations. One nurse in a neonatal intensive-care unit told me that she prays publicly with patients and families, though only if the unit chaplain is not available. “At different times in the middle of the night — when the chaplain had not gotten here yet and the baby was dying — we’ve actually taken water and blessed it, and blessed the baby ourselves,” she explained. Doctors, ill-prepared to offer spiritual support in their own faith, struggle even more when they work with patients or families of different religious backgrounds. Many want to help but don’t know how; patients, families, chaplains, doctors and nurses often lack a common language to discuss spirituality. Surveys reinforce these findings, showing that close to three-quarters of advanced cancer patients do not receive the spiritual or religious sustenance they need from health care organizations and close to half do not receive it even from religious groups. My research suggests that professional chaplains — who are still mostly Protestant — would be more effective if their ranks better represented the religious demographics of the contemporary United States. At the very least, they should become more conversant with faiths other than their own. While hospitals will never have the funds to employ all the chaplains of different faiths they need, diluting the symbols and rituals of particular traditions undermines the chief goal of any chaplaincy — to provide spiritual comfort. The most successful hospitals I investigated didn’t water down religion but made room for more faiths, such as Judaism, Islam and Buddhism, in the same chapels. Chaplains also need to help doctors and nurses respond to the religious diversity in their midst — an achievable goal if nursing and medical schools collaborated with chaplaincy educators to better prepare physicians and nurses to respond to requests for spiritual support. Such changes will probably not make health care more efficient or less expensive. But these reforms will make it more compassionate. When a child becomes gravely ill or a grandparent nears the end of life, most Americans say this is exactly the remedy they seek in our modern temples of science. 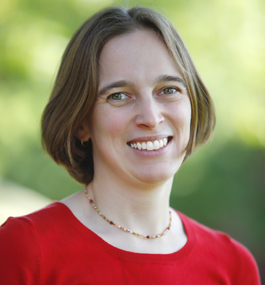 Wendy Cadge is an associate professor of sociology specializing in religion in the contemporary United States, especially as it relates to health care, immigration and sexuality.